1. Moving out boxes. You should always have moving out boxes varying in sizes and shapes. The moving out boxes would be where you will place in all your stuff (personal stuff and household chores). These should also come in different sizes and shapes in order to accommodate all the different stuff to place inside the box. 2. Packing tape and labeling markers. You will need to securely pack all the boxes where all your belongings are placed. You will need all sort of packing tapes from small packing tapes to bigger tapes. Labeling markers are also necessary because these will be the same marking tools that you will need in labeling the boxes after they have been loaded into the new house. 3. Cushioning materials. Bubble wraps are usually the more useful ones. Bubble wraps come in package and they are usually less expensive when they are being purchased in bulk. Since you will be packing the entire household stuff, might as well buy the bubble wraps in big bulk. 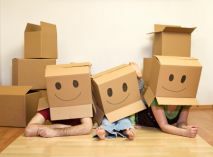 With these packing materials with you, you will surely survive the dreadful process of moving out.